MESA is currently developing two specifications: MESA-ESS and MESA-Device/SunSpec Energy Storage Model. 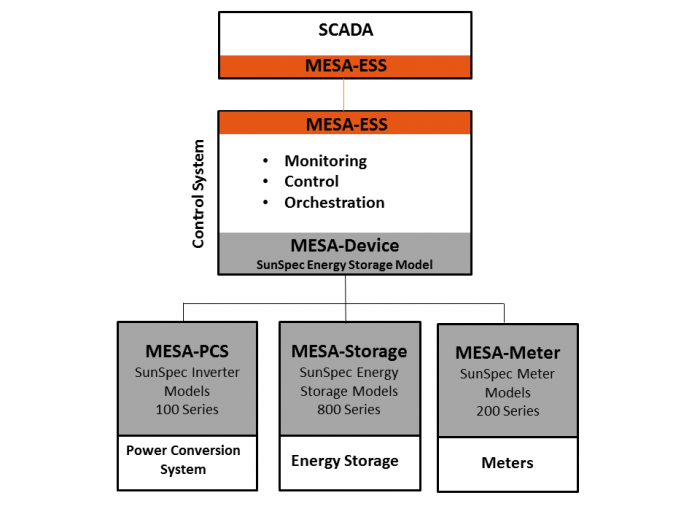 MESA-ESS addresses communication between a utility’s control system and energy storage systems (ESS). MESA-Device specifies standardized communications between components within the ESS. The MESA-ESS specification (update released December 2018) defines the communication requirements for utility-scale energy storage systems (ESS), including ESS configuration management, ESS operational states, and a profile of the IEEE 1815 (DNP3) standard based on the IEC 61850-7-420 information model for advanced DER functions. These advanced DER include all of the functions defined in IEEE 1547:2018, California’s Utility DER Electric Rule 21 Interconnection, and the European ENTSO-E DER interconnection requirements (2016), as well as additional functions of particular interest to ESS. This specification references the DNP3 Application Note AN2018-001 which is based on a DNP3 Mapping Spreadsheet, which directly maps the IEC 61850 data objects for basic and advanced DER functions to DNP3 data objects. The purpose of this MESA-ESS specification is to support the use of communication standards, promote interoperability, and minimize the amount of non-recurring engineering that is required to integrate ESS into utility operations using DNP3. MESA-Device Specifications/SunSpec Energy Storage Model consists of three separate specifications for inverters, meters, and storage which address how energy storage components within an energy storage system communicate with each other and other operational components. MESA-Device Specifications are built on the Modbus protocol. The Energy Storage Workgroup, run by SunSpec Alliance with contributions from MESA members, worked through 2015 and 2016 to produce an updated draft specification for MESA-Device/SunSpec Energy Storage Specification (Draft 4). The specification was released in DRAFT status for feedback and testing in July 2016 and updated October 2017.